Former Gov. Dannel P. Malloy first raised the idea of sharing the fastest-growing cost in the state budget with cities and towns. But while Malloy failed to win legislative support before he left office one week ago, the debate over whether to bill communities for a share of municipal teacher pension costs is not over. 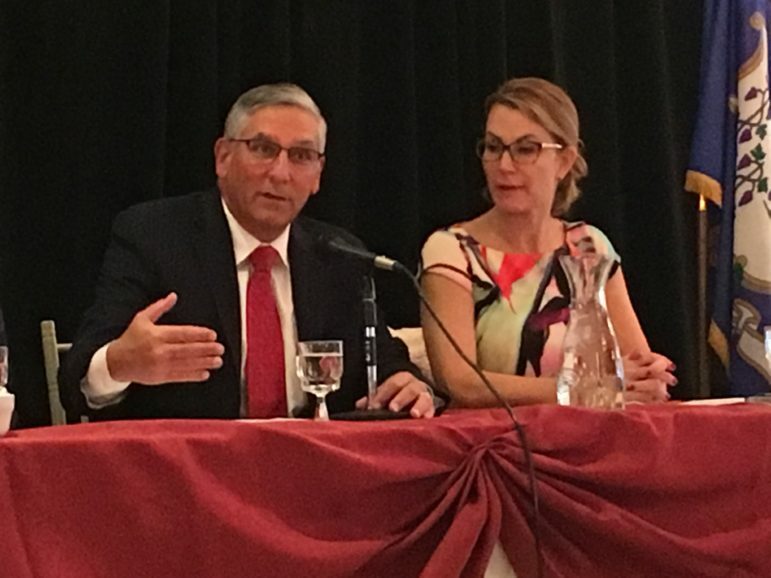 Legislative leaders revisited the issue Wednesday at the Connecticut Council of Small Towns’ annual meeting. And while Republican leaders remain steadfastly opposed to cost-sharing, two Democratic leaders were open to shifting some expenses onto local budgets — albeit at more modest levels than Malloy originally suggested. After more than seven decades of inadequate contributions by legislatures and governors serving between 1939 and 2010, the pension fund for municipal teachers holds enough assets to cover just 58 percent of its long-term liabilities. The ratio would be considerably worse had the 2007 legislature and then-Gov. M. Jodi Rell not decided to borrow $2 billion to bolster the pension fund’s assets. Still, because Connecticut must catch up on billions of dollars in missed contributions — as well as the potential investment earnings it forfeited by not saving — the annual contribution to the fund is projected to skyrocket. The latest actuarial valuation calls for the annual contribution — about $1.1 billion now in a $19 billion General Fund — to approach $3 billion by the early 2030s. But many argue that number, though imposing, is extremely conservative. For one thing, it’s contingent on pension investments achieving an average return of 8 percent over the next decade-and-a-half. A 2015 study by the Center for Retirement Research at Boston College projected that if Connecticut achieves a more realistic 5.5 percent return on pension investments, the annual contribution could exceed $6.2 billion by 2032. Malloy first proposed in 2017 that communities bear one-third of the cost, starting at about $400 million per year. Municipal leaders fought back vociferously, arguing the state dramatically boosted teacher pension costs through its fiscal irresponsibility, and therefore should bear the cost of fixing it. “We didn’t break it, why should we buy it?” Coventry Town Manager John Elsesser, former COST president of the Connecticut Council of Small Towns tweeted when Malloy first proposed cost-sharing. But Sen. Cathy Osten, D-Sprague, co-chairwoman of the legislature’s Appropriations Committee, said the former governor’s concerns are reasonable. Pension costs are consuming an ever-increasing portion of state finances, and a more modest cost-sharing plan could be explored. “We have a huge problem with teachers’ pensions … and we have to deal with this issue going forward,” she said. Osten, who also is first selectwoman of Sprague, noted that while municipal teachers receive a pension, they do not receive Social Security. Were they eligible, cities and towns would have to contribute toward this benefit. Though she didn’t offer a specific cost estimate, Osten said the legislature could consider requiring communities to contribute an amount to the teachers’ pension equal to the Social Security contribution — but only for new teachers. Osten also echoed another concern raised by Malloy, that the current teacher pension system favors wealthy communities over poorer ones. For an example, Osten cited Greenwich — one of Connecticut’s wealthiest municipalities — and New Britain, which is one of its poorest. Both have similar populations and school enrollment totals, but Connecticut spent $24 million more last year to cover pension costs for retired Greenwich teachers than for those from New Britain. House Majority Leader Matt Ritter, D-Hartford, also is open to exploring a modest cost-share. Ritter suggested the legislature build a new limit around the median teacher salary level. Communities that choose to pay teachers above that median level would make a contribution toward the state’s pension costs. The majority leader also said this only should apply to new teachers hired after the law is passed, and the legislature should not time this requirement to take effect before 2024, so communities could plan for the expense. But Southbury First Selectman Jeff Manville, a Republican, said Ritter’s suggestion would be unfair unless legislators do more to reform the binding arbitration process that often determines teachers’ pay. “The binding arbitration [system] puts us in a position where you do have to raise teachers’ salaries,” he said. Binding arbitration does consider a community’s ability to pay raises, and Manville said towns that have controlled expenses and kept their tax rates low are punished by this process. Senate Minority Leader Len Fasano, R-North Haven, who also opposed a local cost-share for teacher pension contributions, agreed. Fasano also said he fears that state government, which created the pension crisis, would gradually increase the municipalities’ portion of the pension bill if a cost-sharing arrangement were adopted. 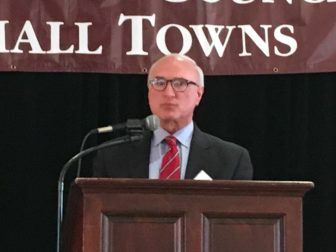 Ridgefield First Selectman Rudy Marconi, a Democrat and president of the Council of Small Towns, said rather than shift pension costs onto towns, the legislature should work more closely with communities to find ways to reduce government costs. “Make us a partner and give us an opportunity to be heard,” he said. The council represents 110 Connecticut towns with populations of 30,000 or less. It should not be a struggle – and certainly not an impossibility – for families to meet their basic needs. Yet it often is, and that’s why organizations like diaper banks exist. While we spend our days trying to get children the things they need to thrive, we all too often see policymakers float proposals that will do the opposite. Gov. Ned Lamont’s reported consideration of a sales tax on groceries and medicine definitely falls into that category. If Connecticut REALLY needs to raise a billion each year... don't use traditional tolling. The easy way is low mileage-based use fees on all roads. This is tracked using satellite and/or cell-phone technology. On-board devices already in all cars built since 1998 can be programmed to record miles driven on Connecticut's roads. ($30 transponders under the hood are a less-intrusive alternative). Out-of-state drivers are asked to pull over to a welcome station the first time they enter the state to buy a transponder. For drivers crossing our border on local roads, licensed roadside stores or gas stations can sell the transponders, the way lottery dealers do now. Walking through Bushnell Park you can gaze upon many places that say who and what we are as citizens of Connecticut. Carved on one of these is “After the darkness, comes the Sun” (translated from Latin). People who are familiar will know this is carved on the Soldiers and Sailors Memorial Arch (1886), the oldest triumphal arch in North America. Clearly the clouds are hovering over our beloved state once again. In those mountains of precipitation lie unknown and unseen dangers. From time to time, however a flash of lighting or a streak of sunlight will reveal the dangers that surround us. One of these dangers revealed to us is a public bank, most recently espoused by State Rep. Josh Elliott (D) Hamden. There’s no such thing as a panacea to Connecticut’s budgetary woes, but there could be something close: a public bank. North Dakota is the only state in the U.S. that has one. This century old institution, Bank of North Dakota, has spun off $300 million in revenue to the state over the last decade alone and has also provided some significant functions. Opportunity is knocking, but are legislators listening? 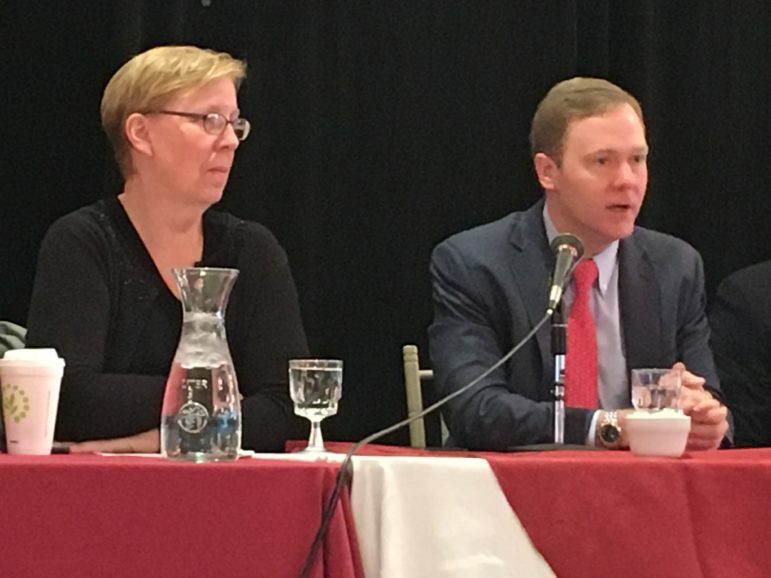 Gov.- elect Ned Lamont and the incoming state legislature will face a bleak financial landscape as they work together to craft Connecticut’s budget for the next two fiscal years. Put bluntly, there are two ways to deal with our state’s severe fiscal shortfall: start making structural changes now to the way the state collects and spends money or use the “Rainy Day Fund” to kick the can down the road. We hope they will choose the more difficult path and tackle the systemic issues that have caused and exacerbate the problems we face.